I forget about God a lot. You’d think forgetting God would be difficult to do. We’re not talking about the lid of the orange juice here: God is huge and everywhere. Yet I manage to do it on a regular basis. I don’t hate God. I don’t run about like some ranting atheist, desperate to convince people that I can’t stand God and, what’s more, he doesn’t exist. I love God and I think I should put him at the centre of my life. But, I guess, before I put him there, I kind of … misplace him. I get distracted. I forget about God. I even forget about God when I’m doing God things. I go to Mass on Sunday and I spend forty minutes saying “shhh!”. I rattle off grace before meals, but I’m thinking “are the kids going to eat this?”. I fast-forward through the chore of night prayers, desperate to get to the part where everyone’s asleep and I can have some mental space. I suppose I could put the blame on the pace of my life. 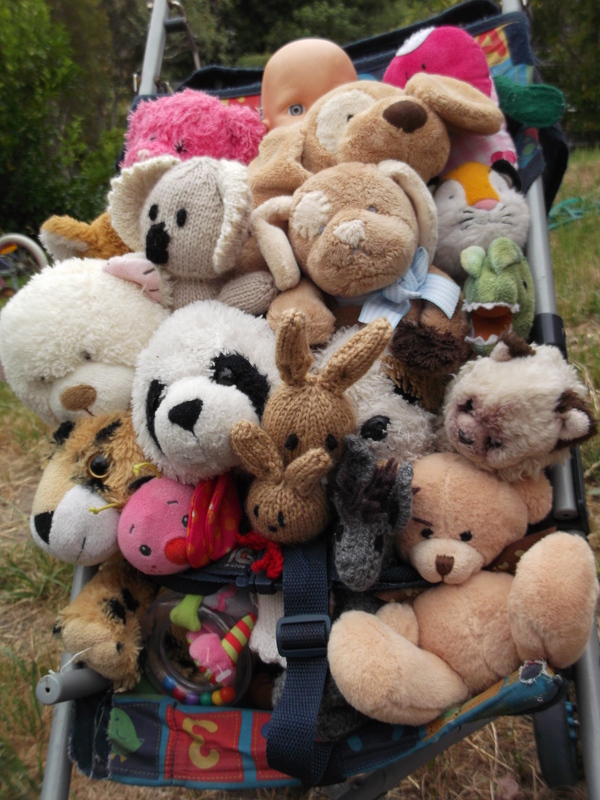 It’s all school run, laundry, nappies, notices, budget, groceries, Book Week, walkathon, lunches, homework. But that’s not really an excuse – that’s the reason I need God! Sometimes I wonder what it would be like to be a monk. To spend my whole life in prayer and peaceful contemplation. All that chanting and the bells and the incense. And all that silence! I wonder if I would have as much trouble remembering to put God in the centre of my life if I were a monk. Can you imagine? I’m out in the monastic garden, meditating and tending the monastic herbs. My mind starts to wander – I start to forget God and then – DONG DONG DONG! The bells ring and remind me it’s time to pray. 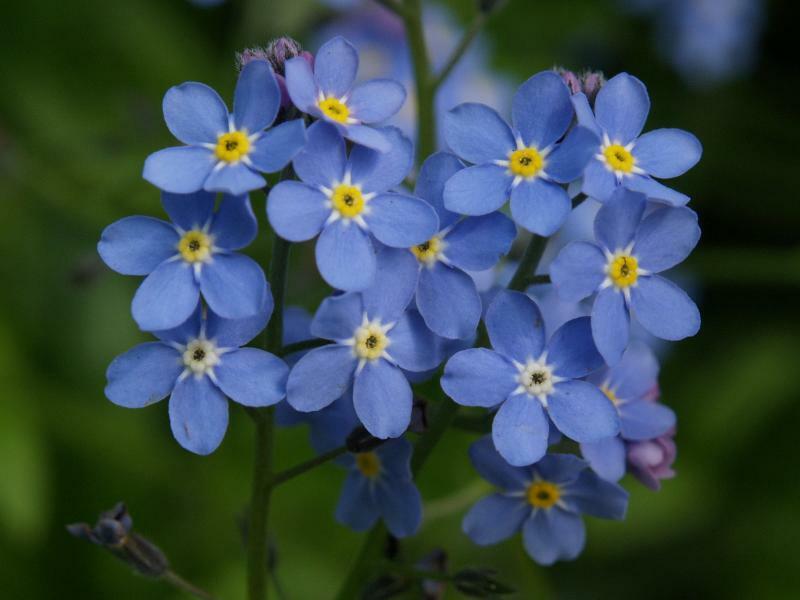 Or I’m walking about the cloisters in a bit of confusion – what was it I wanted to focus my entire life on again? Then I round a corner and there’s a massive great crucifix on the wall – oh, that’s right: God! Everything I do, everything I hear, everything I look at, everyone I speak to – my whole life would be structured around my relationship with God. Having said this, I don’t think I was called to be a monk. Even when you take gender restrictions into account, I know I’m not built that way. I’m far too extroverted for monk life. But I wonder – is there something I can learn from the monastery? Can I take stock of what I’m doing and somehow structure my life so that it can be more prayerful? There’s an article I’d love to see in Better Homes and Gardens: “Transform Your Home into a Monastery: From Domestic to Monastic in Eight Easy Steps”. But, seeing as though Tonia Todman isn’t onto it yet, I’ll see what I can do with some vague ideas in bullet points (ain’t nothing like vague ideas in bullet points!). Monks complete repetitive, menial tasks and use them as an opportunity to meditate. When you’re in my line of work, there is an abundance of these meditation opportunities to choose from. I would like to be more mindful of what I’m filling my mind with. What do I watch, read and listen to? Do I find it life-enriching or vaguely depressing? I could write reams on this, but the short version is that TV as background noise, nasty commercial breakfast radio and any magazine with articles about celebrities losing their baby weight should go. Out. Not worth my time. Monks get up very early. I resist this a bit, especially on freezing cold mornings, but I know on the days that I make an effort to get up at least fifteen minutes before the rest of the house, I can find a little pocket of peace in my day. It would be good if I could find a book of one-minute meditations to work through as well. Monks make it their business to show God’s love to all they meet. I need to work on this. Especially when my children are making me want to stick pins in my eyes. Maybe I could get a phone app that rings out with a bell sound for nones and matins and the angelus (I don’t know – when do monks pray again? Lauds? I think that’s one of them…). Does such an app exist? That would be cool. The other thought I had was to do with my car. Many years ago, I used to work for a Catholic charity. My boss was a deeply religious young man, quietly holy, but not in an annoying way. Sometimes, I would get to use his car when I drove out to give talks at schools. There was something special about this little red car. It was such a peaceful haven. Rosary beads hung from the rearview mirror, sacred music played from the CD player and there was a car air freshener with “incense” fragrance. OK, so maybe I made up that last one, but my point is, driving my boss’s car was like stepping into a church. I would arrive at my destination feeling all calm and centred. So I need to ask myself: now that I spend half my life driving children places (and they spend half their life driving me up the wall), what can I do to make my car a prayerful place? I’m sure there are many more ideas that should go here. I hope you share any you think of in the comments (it would really make my day!). After that, all I’ll have to do is gather these ideas together and, well, do them. And then one day you’ll see this woman standing at the school gate, all calm and loving and prayerful. Radiating God’s love to all she encounters. And it will be me. Mrs Monk. The contemplative who cooks casseroles. This entry was posted in God in the Mess and tagged atheism, Better Homes and Gardens, catholic, catholicism, christian, christianity, contemplative, forgetting god, God, monastery, monastic, monk, motherhood, peace, religion, religious, retreat, sahm, spirituality, stay at home mom, stay at home mum, tonia todman, vocation on May 27, 2013 by katelikestocreate. I’ve decided if I’m going to be a serious Mummy blogger, I’d better start posting some recipes. Isn’t that what we’re supposed to do? Here’s one of my favourites. My great aunty used to bake apple teacake with me when I was small so it comes with warm and comforting memories. I always wanted to be the sort of mum (does she even exist?) who has some sort of teacake ‘on hand’ when friends drop by. Wouldn’t that be amazing? A girl can dream. Hmm. A girl can read a little too much Anne of Green Gables than is healthy for her too. This particular recipe is gluten free. Of course, you can use regular flour if you like, but I’m just saying it works really well as a gluten free cake – not all cakes do. OK, enough waffling, on to the recipe! 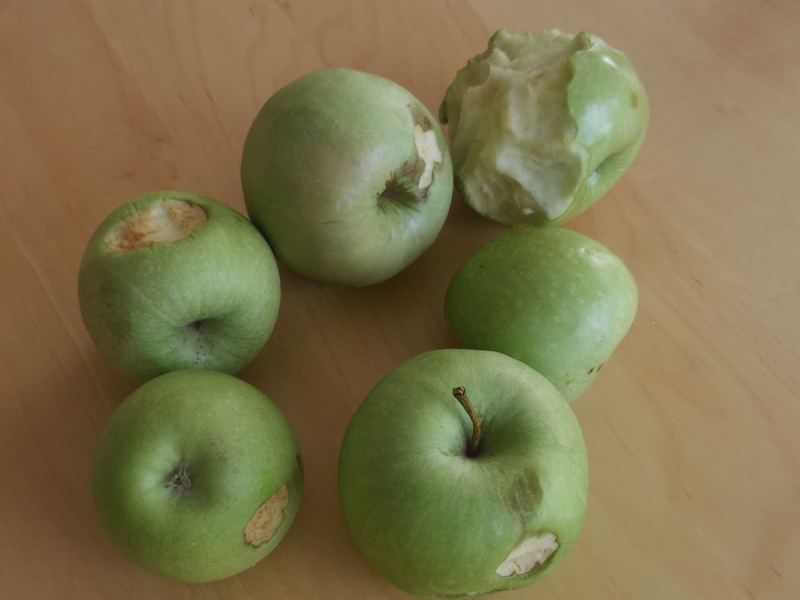 My son is incapable of eating an entire apple. Why finish this one when I can just trot off and start another? It drives me to distraction. There are lots of things you can do with these discarded apples, I suppose. Some people stew them, some juice them, Mr Knightley cuts them up into coin shapes and rebrands them as “apple money” which the kids think is the best thing ever. 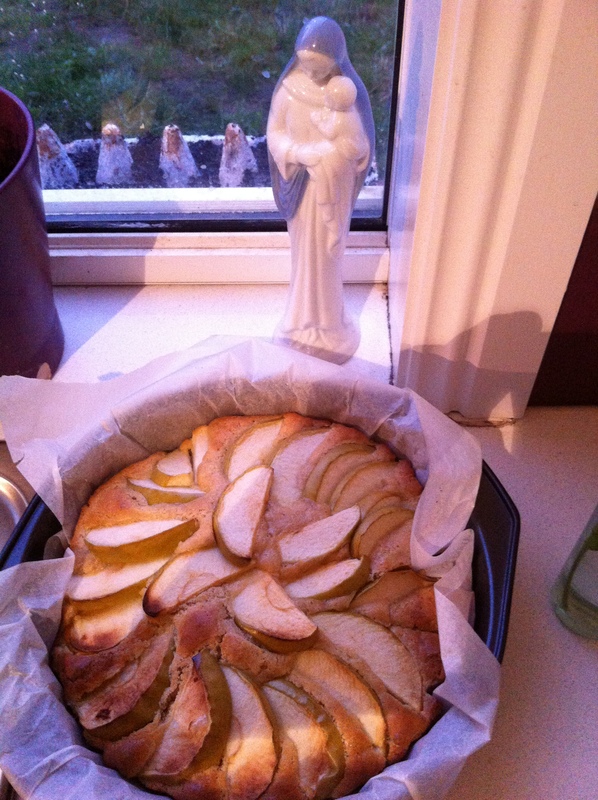 But when I was feeling a craving for apple tea cake, I realised all at once that I could make something wonderful from these little green cast-offs. So here we go. I should probably point out here that these pictures were taken during my first attempt at the cake and I’ve learnt some extra things since then. 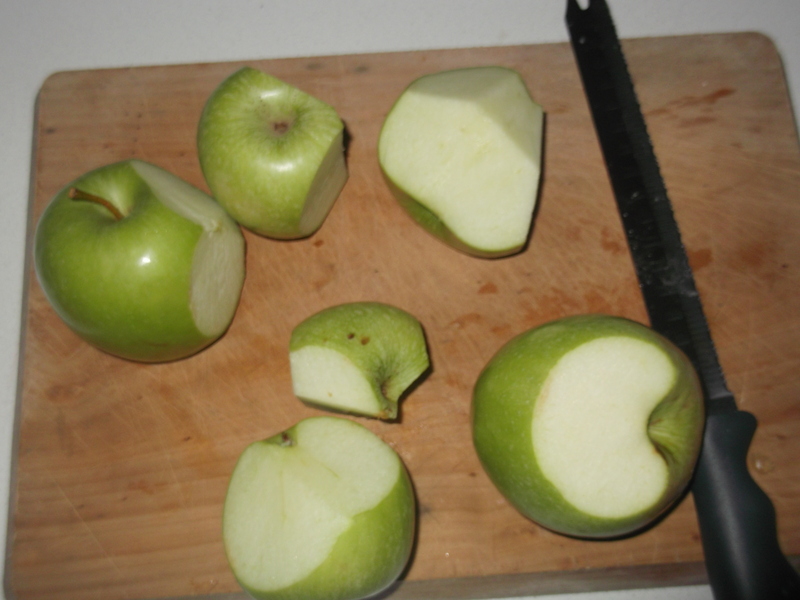 The most important point being that you really only need enough half-eaten apple to make up one full-sized one. I have far too many in this picture! And slice them up. Slice them as thin as you can – I’ve done it a bit too chunky in this picture. 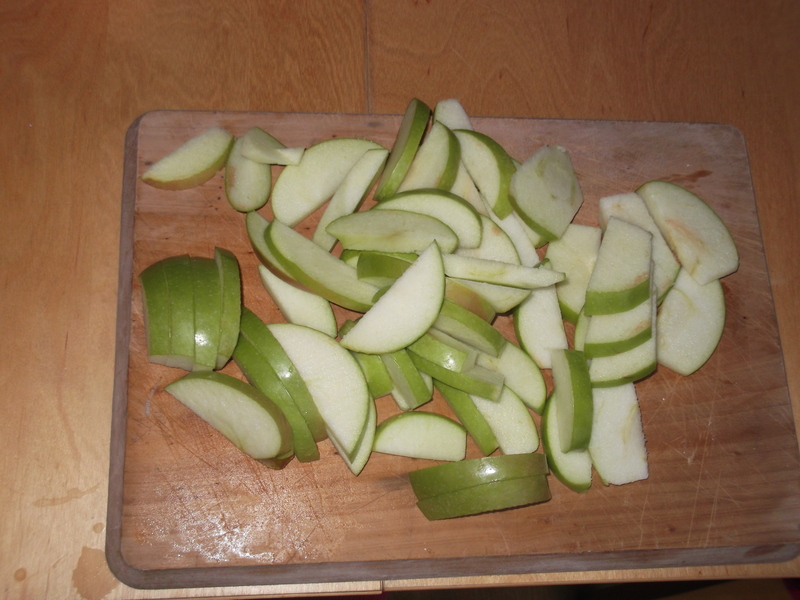 Why include this picture if it shows far too many apples all sliced the wrong way? Because I took it, by gum! Do you have any idea how difficult it is to photograph what you’re doing whilst baking a cake with two little boy helpers? No? Well sit down and stop complaining! The best thing about this recipe is that you can make it from things you already have in your cupboard. I have no time for recipes with exotic ingredients! So beat up the softened butter until it gets a little paler, then add the sugar, eggs and vanilla. 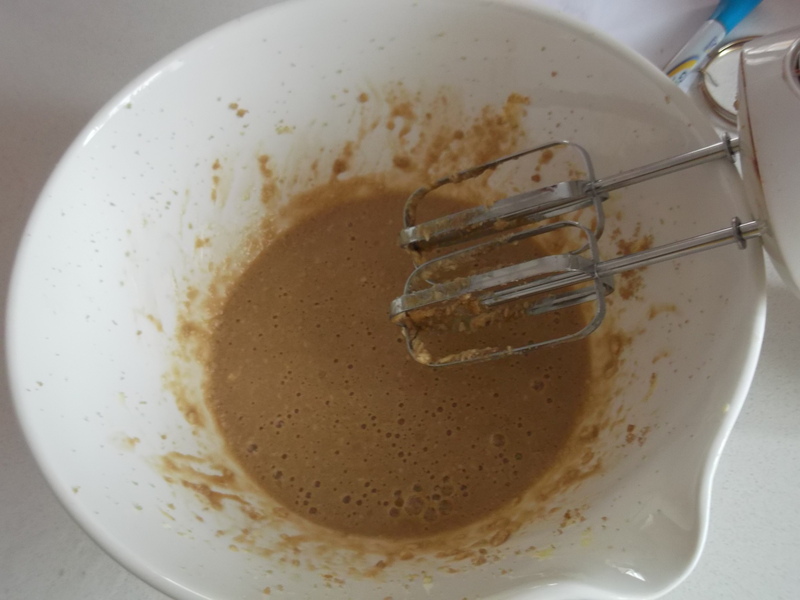 Mix with an electric mixer (or stir up heaps with a wooden spoon). Turn off the electric mixer and hand out the beaters to lick. That should get you five minutes worth of peace. 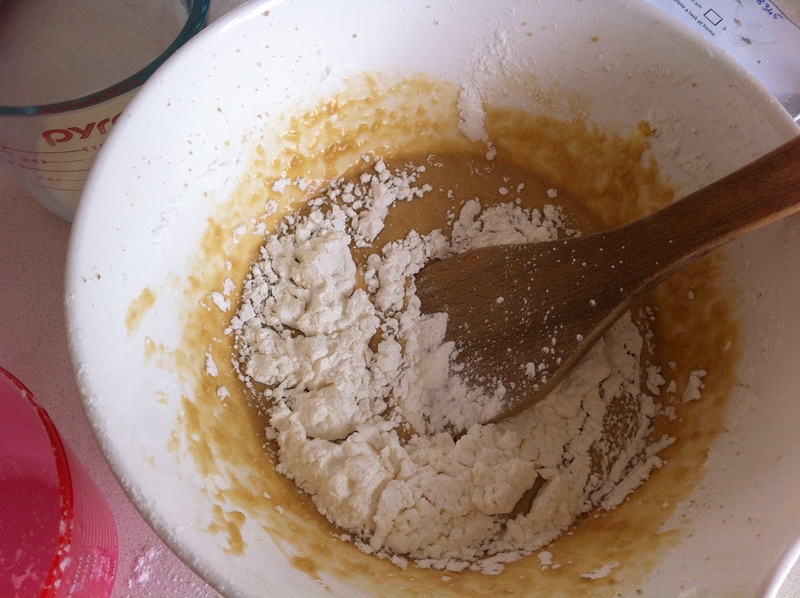 Now stir in half the flour and half the milk, then the rest of the flour and the rest of the milk. Make sure nobody dips their beater back in once they’ve licked it clean. 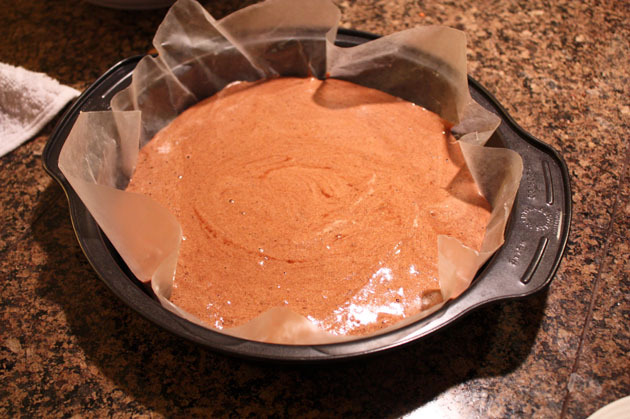 Now pour the batter into the cake pan. I forgot to take a picture of this stage, so I stole one from the Internet instead. Shhh. Don’t tell anyone. Arrange the apple slices on the top and bake for 25-30 minutes. While it’s still warm, rub the 10g (a little knob) of butter onto the cake so it melts. Or, if you’re like me and forget, melt it in the microwave and brush it on later. Then sprinkle with the sugar mixed with cinnamon. This tastes best if it’s still warm, but still pretty good when it’s cooled. I made this for my mummy friends on Friday and thus fulfilled one of my life’s ambitions as a stay-at-home mum. Bliss. 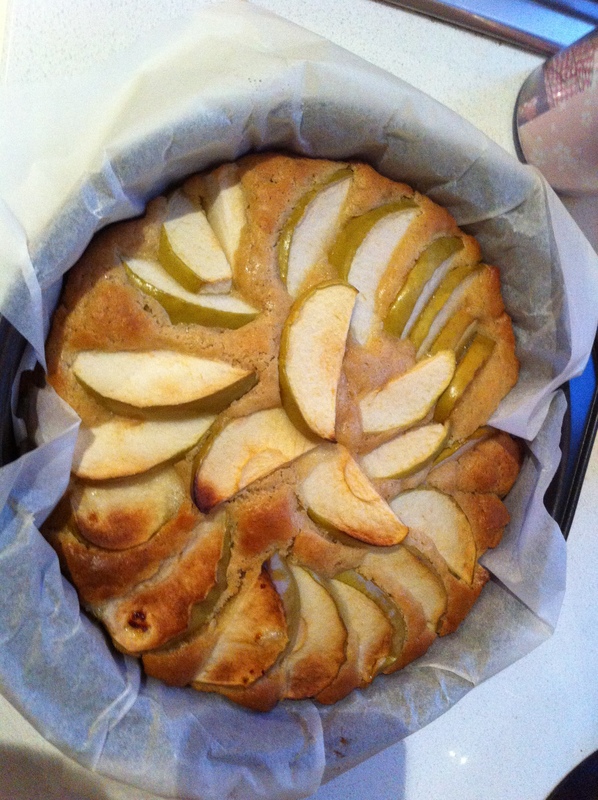 The first time I made this, of course, I had far too much apple left over. 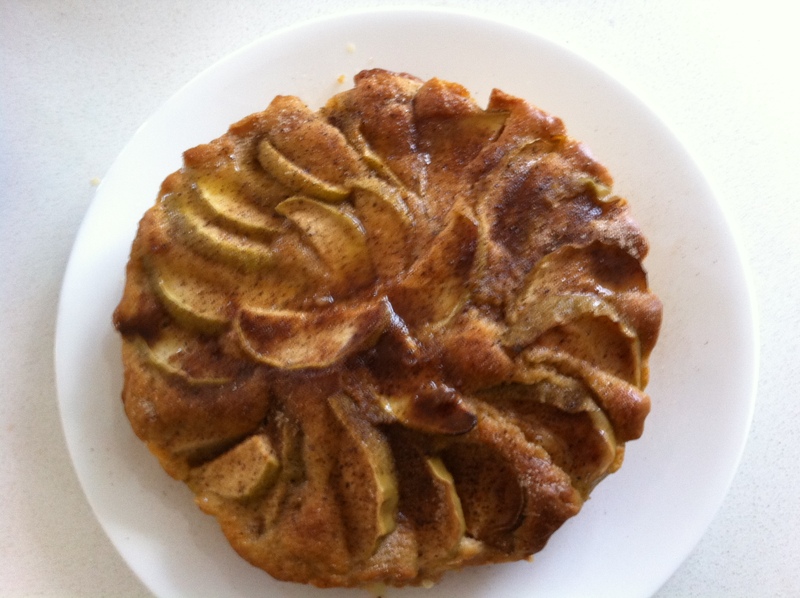 This entry was posted in Keeping House and tagged afternoon tea, anne of green gables, apple, apple tea cake, baking, cake, celiac, cinnamon, coeliac, dessert, easy gluten free, easy recipe, food, gluten free, gluten free apple tea cake, gluten free baking, gluten free cake, gluten free cooking, gluten free recipe, half-eaten apple, morning tea, preschooler, recipe, recipe tutorial, sahm, simple ingredients, stay at home mom, stay at home mum, tea cake on May 19, 2013 by katelikestocreate. I would really love to get to the stage where I sail into church on a Sunday morning with four children all clean and combed and beautifully turned out in their Sunday bests. All with shoes on and with a good amount of cash for everyone to put on the plate. I will get there one day, but in the meantime, the best I can claim is that we turn up and that most of the time they behave themselves. On this particular occasion, the best I can claim is that we turned up. Mass would begin in one minute. Thankfully, the gospel was one I had presented before and could talk on without too much trouble. I dashed inside, grabbed the book, threw the cloth and candle on the little table, forgot the matches, and told Father I was there, thirty seconds before he processed into the church. I managed to muddle through the Children’s Liturgy program without imparting too much heresy, I hope. We had a good discussion where I told them all about shepherds in the time of Jesus and they told me all about lizards, chocolate, Roary the Racing Car and why Thomas is the best of all the engines. After this, the children brought the gifts up beautifully in the Offertory Procession, even if half of them bowed backwards and sideways and one of them fell over, before dispersing back to their families at top speed. Harry’s face was covered in Vegemite. I didn’t have any wipes or facewashers on me. Well-turned-out children do not attend Mass with Vegemite on their faces. I did so want to have children that people would describe as well-turned-out. Especially Mass people. I considered giving my thumb a swift lick and using it to mop up the offending stain, but then I remembered that the Sign of Peace was fast approaching and I decided that the people around me might prefer to behold a dirty-faced little boy than to be forced to shake a hand covered in a mix of spittle and salty yeast extract. Besides, I had bigger problems just now. Annie must have disapproved of the new translation of the Eucharistic Prayer, because she started voicing her protest at the top of her lungs. I tried all my usual tricks, waved little toys from my handbag at her, but they only made her angrier. Then Father said “let us offer one another the sign of peace”. Annie abruptly stopped shrieking and solemnly offered her small hand to the people standing behind us. After Mass, Mr Knightley and I staggered with Annie into the gathering area for morning tea (the children had already raced there and were smearing biscuits across their faces). Here we faced a gauntlet of opinionated old men which our late priest called the Parish Antiques. First up, one of the Bills, Who’s as Old as the Hills, hobbled over for a grumble about the noisy baby. As Bill is getting a little frail and senile, and is usually rather kindly, I let him have his rant in peace. Next I stumbled into the path of Neville McKinnion, Who has Strong Opinions. “You’re very courageous to be coming to Mass with the children” he smiled condescendingly, then added, with the air of one dropping a gentle hint, “when our four were small, Mavis and I would come to Mass separately and only bring the older ones.” As Neville raised his eyebrows impressively, I bit back the urge to enquire how many of these grown up children still went to church, as I knew it was a sore point for him. I returned my tea cup to Barry O’Shane, Who Likes to Complain. He was having a rant about how so few of the parish school families come to church on Sunday. “They wouldn’t dare!” I snapped, and stalked out the door. Except that that only happened in this blog post. In real life, I smiled weakly and saved my angry rant for my wearily sympathetic husband in the car on the way home. And in the two hours that followed. I guess I’m not being entirely fair to my parish in this post. I could have mentioned that Patricia Baelyn, Who Looks Like Sarah Palin, took Annie for cuddles and politely contradicted Bill for the parts of his rant that were readily coherent. Or I could point out that most of the time people are warm and welcoming and that the Grumpy Old Men do have kind hearts and don’t shrink from hard work when it needs to be done. This entry was posted in Fail., God in the Mess, Misadventures in Motherhood and tagged catholic, Catholic Mass, children, Childrens Liturgy, christ, christian, embarrassment, Eucharistic Prayer, fail, God, Good shepherd, Grumpy old man, jesus, lifestyle, mass, morning tea, offertory procession, Parish, preschoolers, Roary the Racing Car, sahm, sign of peace, stay at home mom, stay at home mum, Sunday Mass, Sunday Masss, vegemite on May 16, 2013 by katelikestocreate. 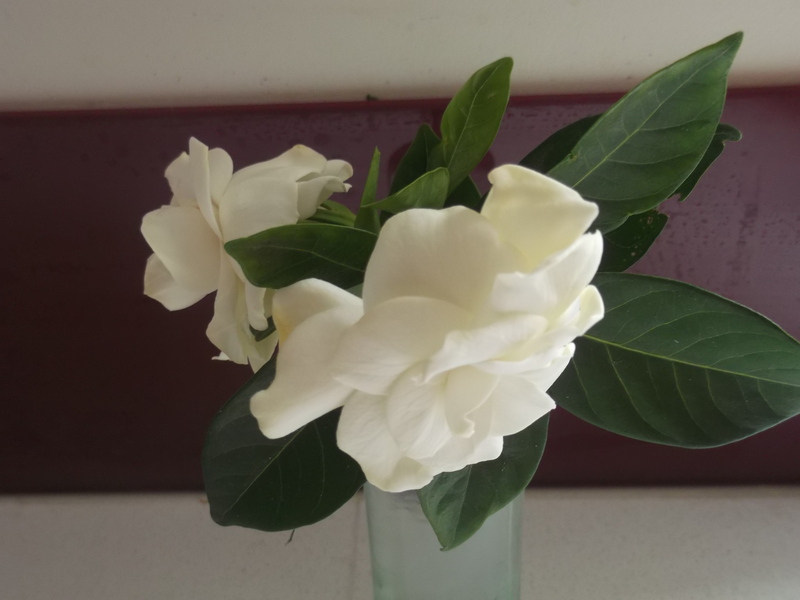 These gardenias from my mother-in-law’s garden. Their perfume make me think of my beautiful grandmother. 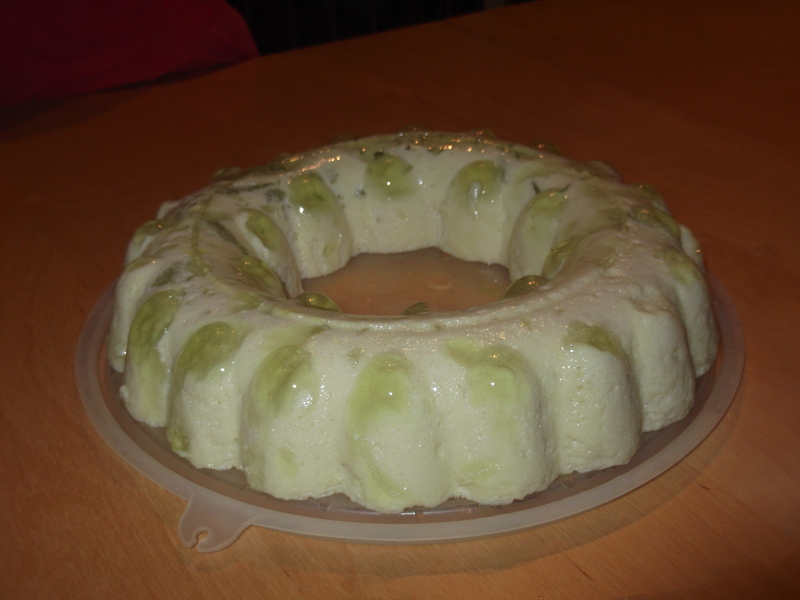 Some green flummery. It looks gross, but it’s sweet and light and tastes just like my childhood. 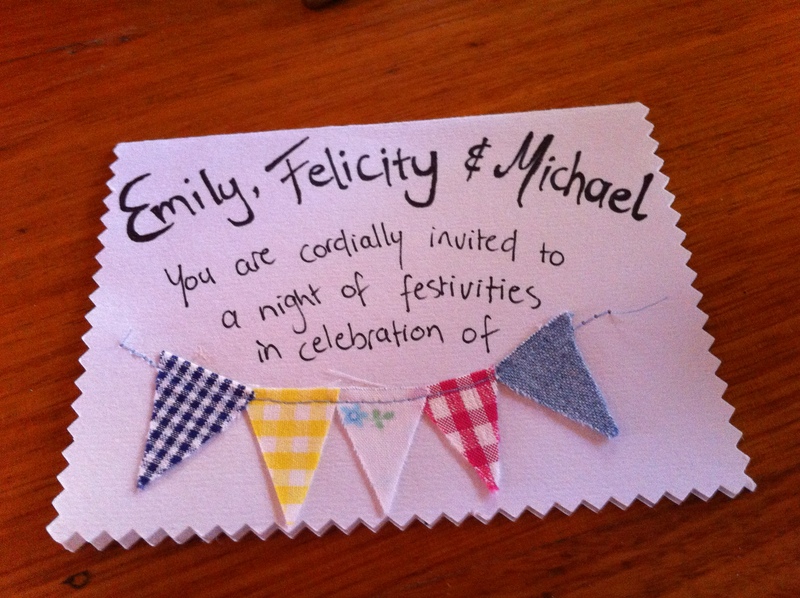 I fell in love with this beautiful invitation to a twenty-first birthday party. It’s not even mine – it’s for three of my siblings (she misspelt “Jan, Cindy and Bobby”), but that’s not the point. Oh, those darling tiny squares of fabric! The little line of machine stitching on the paper! Bunting always makes me smile inside. 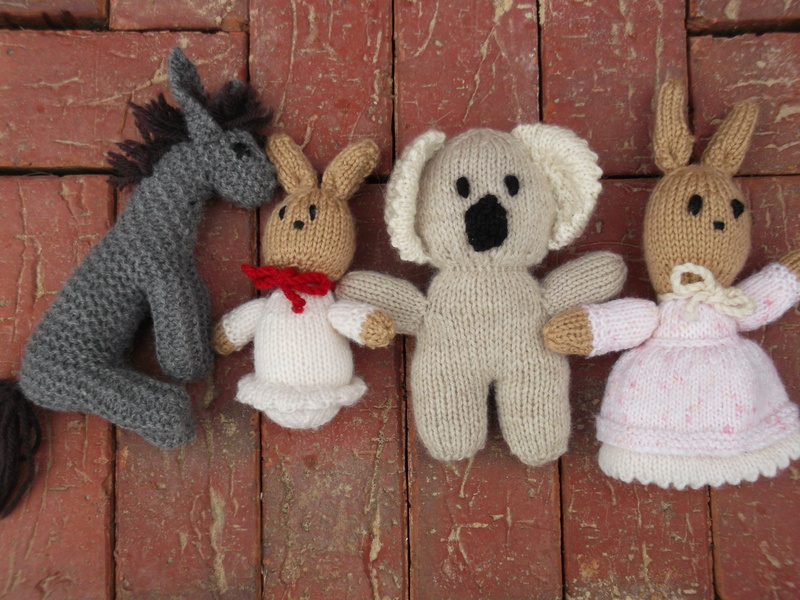 Four hand-made friends given to me my children by my very talented Aunty. They were very quickly welcomed into the family. OK, I must come clean: the handmade gifts did not arrive last week – I took the last two photos months ago and have been meaning to post about them ever since. But aren’t they lovely? I still smile when I look at them. 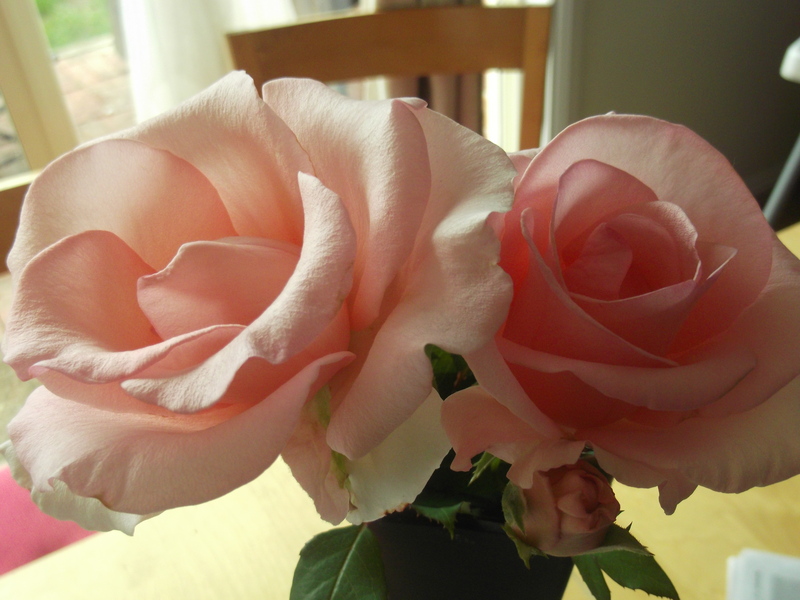 This entry was posted in General Nattering and tagged flummery, fresh flowers, gardenia, handmade gift, handmade toy, happiness, happy, home, invitation, motherhood, parenting, photo, rose, sahm, simple pleasures, stay at home mom, stay at home mum on May 3, 2013 by katelikestocreate.